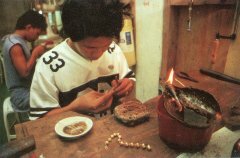 PEARLS... Its beauty and luster made it one of Surigao's Priced dollar earners. To experience the underwater scenery of its marine culture is as enchanting as the movement of the live corals of its environment. A natural aquarium of incomparable beauty, the farm is the pride of Barangay Nabago, 30 minutes by land or by sea from the city proper.